Fall in love with the colors of the season! 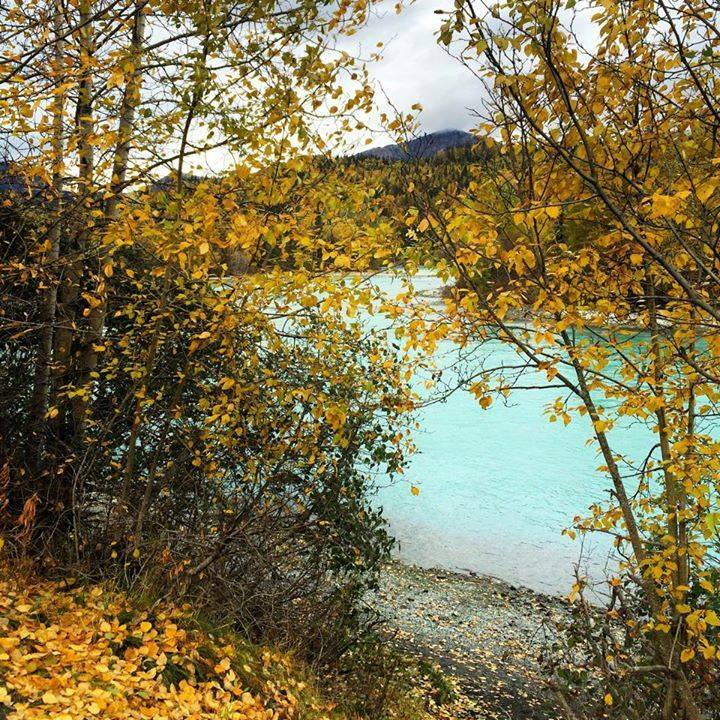 If you’re at all like us, you’ve probably been finding yourself driving around The Kenai, Alaska’s Playground lately with your eyes peeled wide open and your jaw dropped to the floor in pure and utter amazement over the colors of the fall that line our river banks and mountain sides. 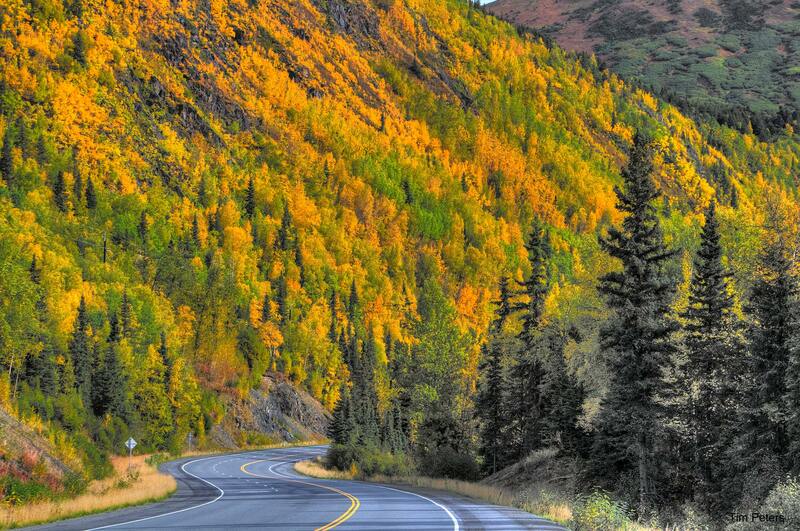 Photo taken on the Seward Hwy. 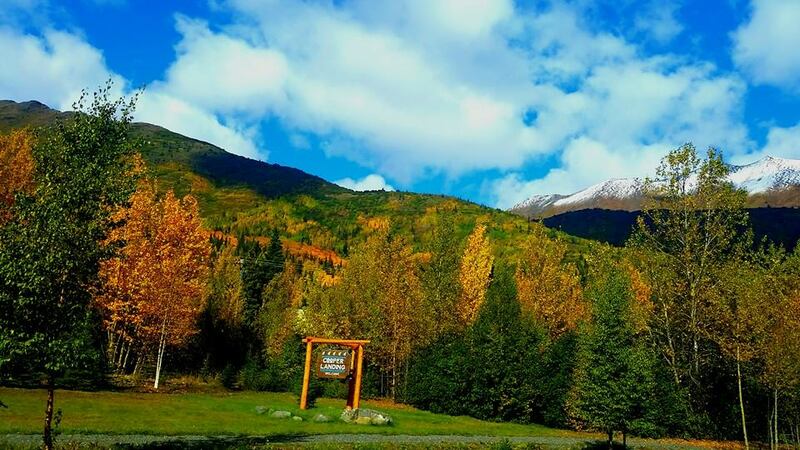 One thing is for sure, nothing beats the view of fresh snow capped mountains with the abundance of fall colors scattering down the mountainside. 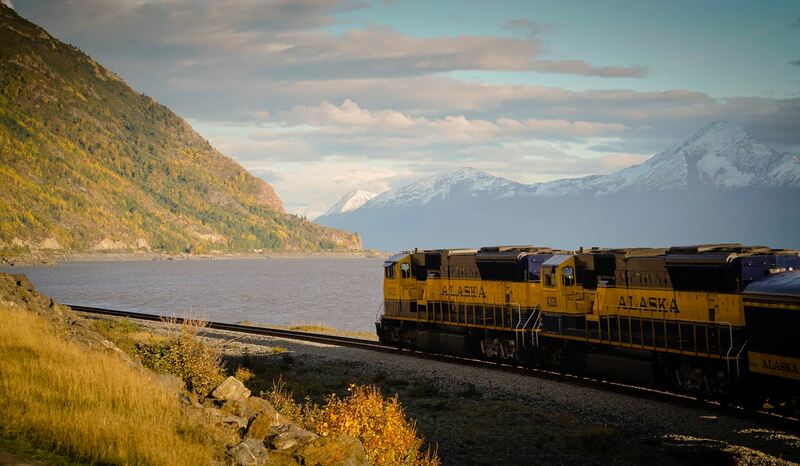 And might we add that one of the best ways to soak in all the colors of fall on Alaska’s Playground is via the Alaska Railroad. 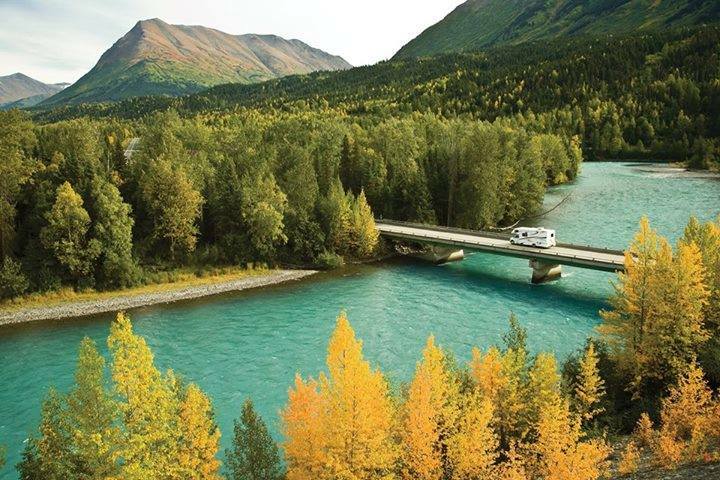 If you are a visitor to the Kenai Peninsula, traveling by RV is still an excellent option in September. The roads usually less congested, construction has let up a bit, and the temps are generally still very comfortable. Oh and the views? Yeah, they will leave you speechless. 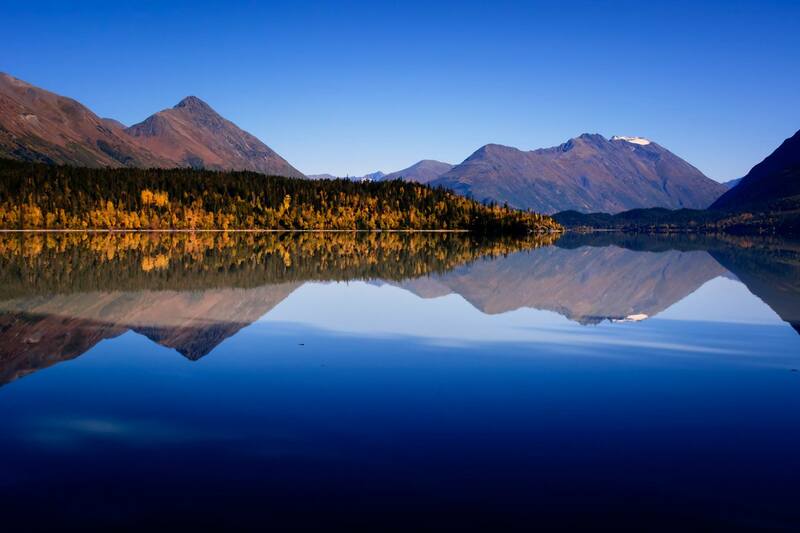 Catching a reflection of some mirrored mountains is another treat that is enjoyed in a whole new light with the magic of fall all around you. Photo from the Kenai Peninsula, Alaska Facebook page. 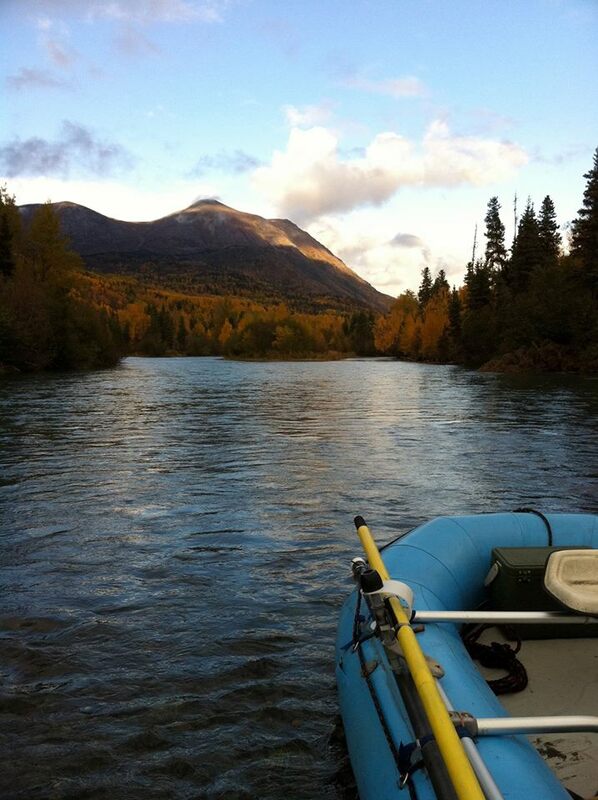 Floating the Kenai River is another activity that offers a whole new perspective during fall season. And just like the roadways, the river is generally much less crowded during September and October! 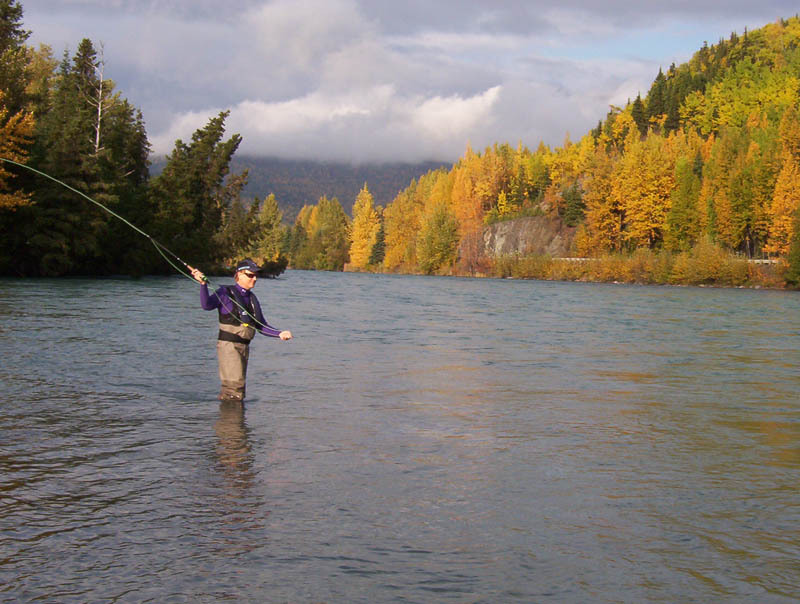 And if you’re an angler, fly-fishing on the Kenai River is an utter paradise during the fall season. 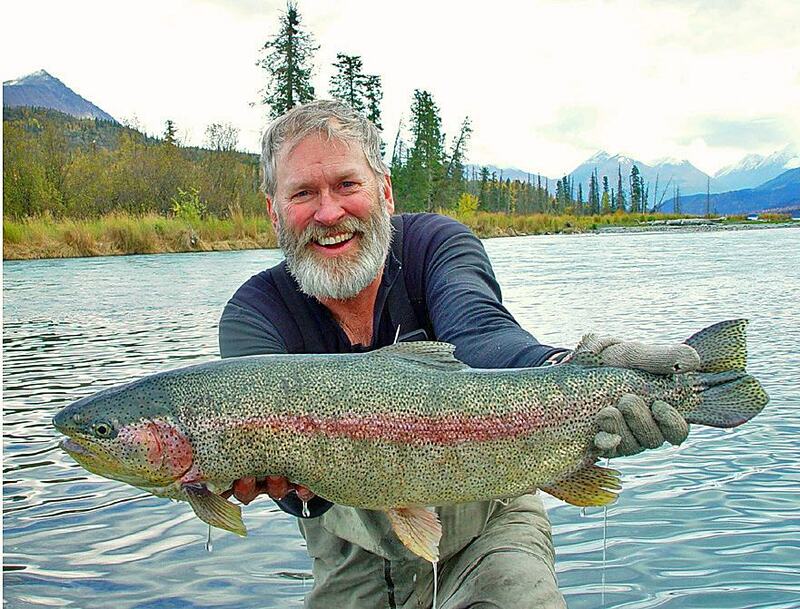 Trophy Trout fishing is known to be some of the world’s greatest on the Kenai River. 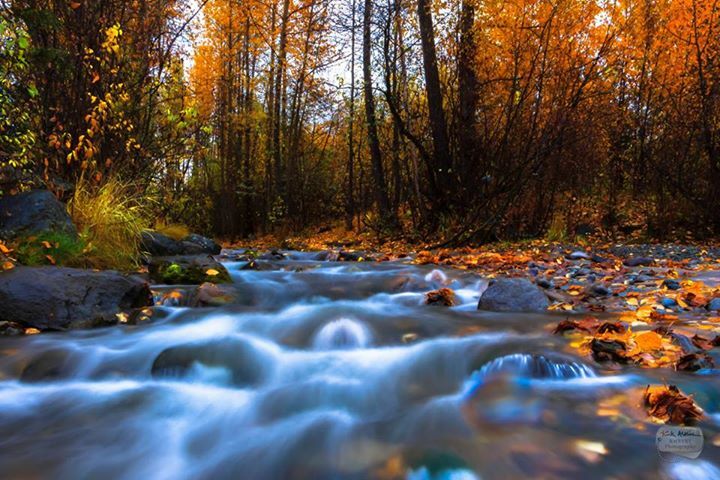 If you’re going to do it, fall is definitely a great time to get out there! If you are going to get outside and wet a line, make sure you get up bright and early so you can catch the vibrant fall colors glistening amongst the crisp morning dew air. 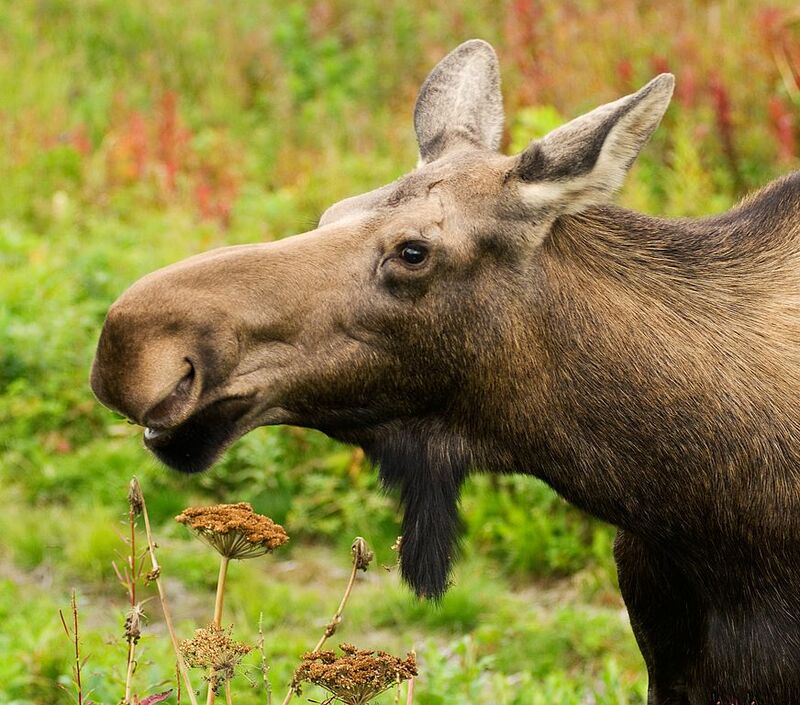 The wildlife viewing on the Kenai Peninsula continues to be (super cute) and excellent during the fall season as well. Photo from Paddle Board Dogs in Kenai Fjords National Park – Seward, AK. 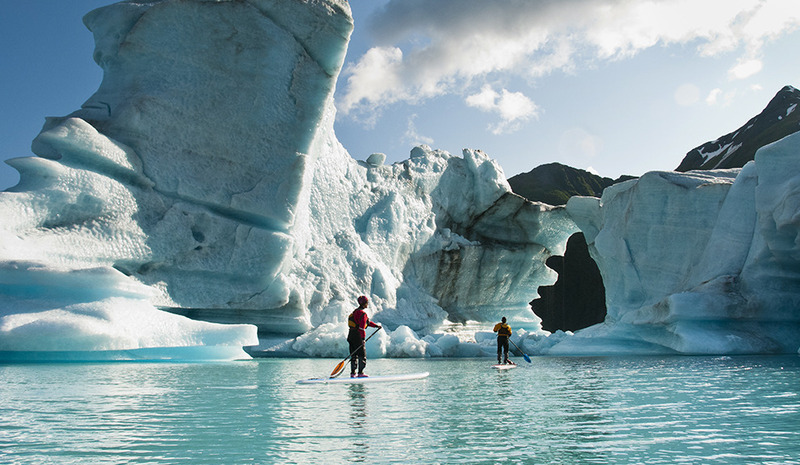 The Kenai, Alaska’s Playground is an outdoor mecca and Stand Up Paddleboarding (SUP) is one of the fastest growing recreational water sports in the world. 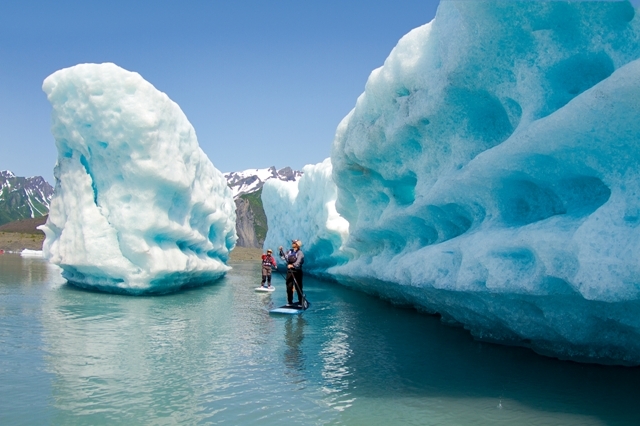 So combining the mountains, glaciers, wildlife and overall beauty of the Kenai Peninsula with a fun water sport that is easily approachable by all ages, sizes and experience levels is a match made in any adventure lover’s heaven. 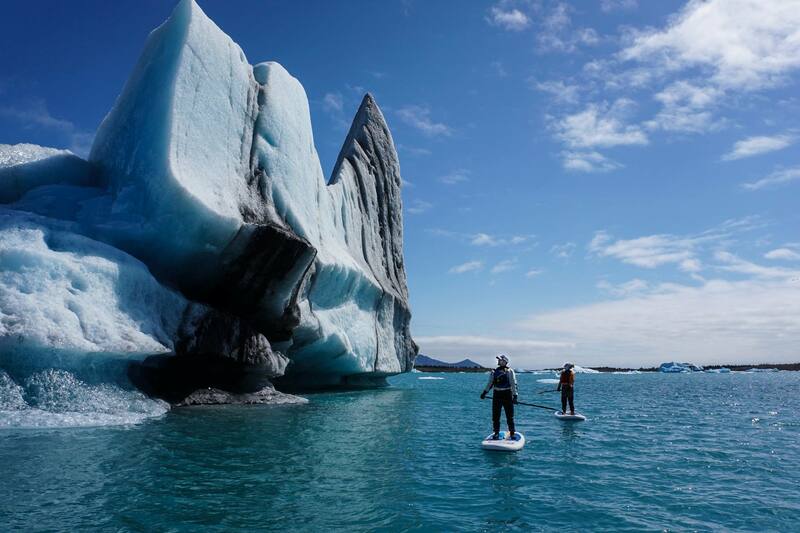 Photo from Liquid Adventures at Bear Glacier. Stand Up Paddleboarding has its roots where all board sports have their beginnings, in beautiful state of Hawaii. Known as Hoe he’e nalu, standup paddle surfing actually has ancient roots but became popular in modern times among surf instructors and photographers trying to get a higher vantage point than the surface of the water. Photo from Scott Dickerson at Aialik Bay in the Kenai Fjords National Park. Basically, SUP uses an oversized surf style board and a long paddle. Many would say that it is a cross between surfing and canoeing or kayaking. Photo from Liquid Adventures in Seward, AK. 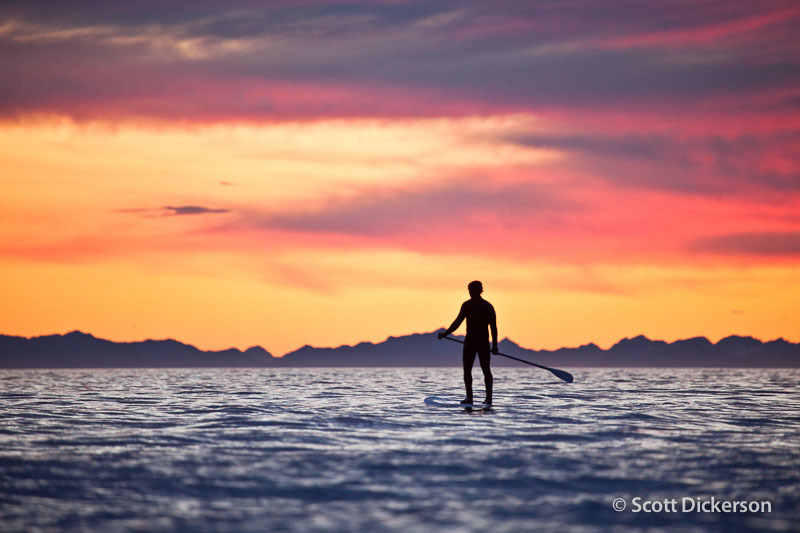 Standup paddling can be done in a variety of forms such as on flat water protected lakes to easy beach paddling, to open water paddling, and all the way to to surfing waves. Photo from Scott Dickerson Photography in Seward, AK. 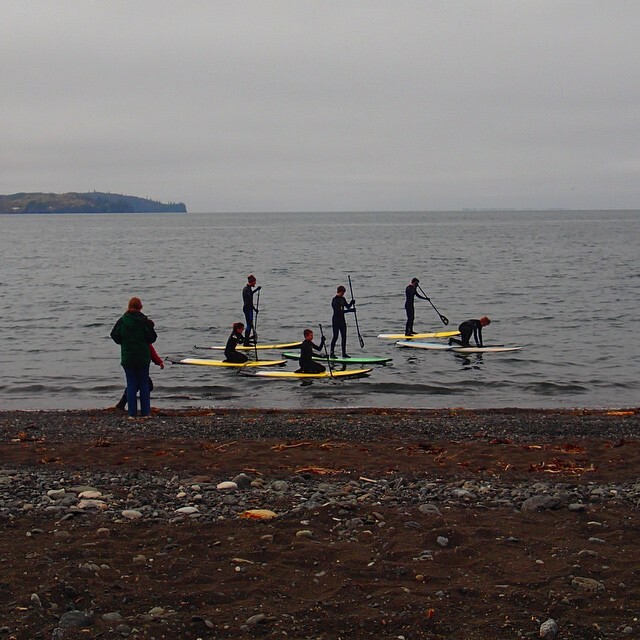 SUP is great for all ages and experience levels. It is a great activity for the kiddos (and bonus for the parents; it will exhaust a ton of energy)! Beautiful photo of some adventurous kids with Howl Alaska. 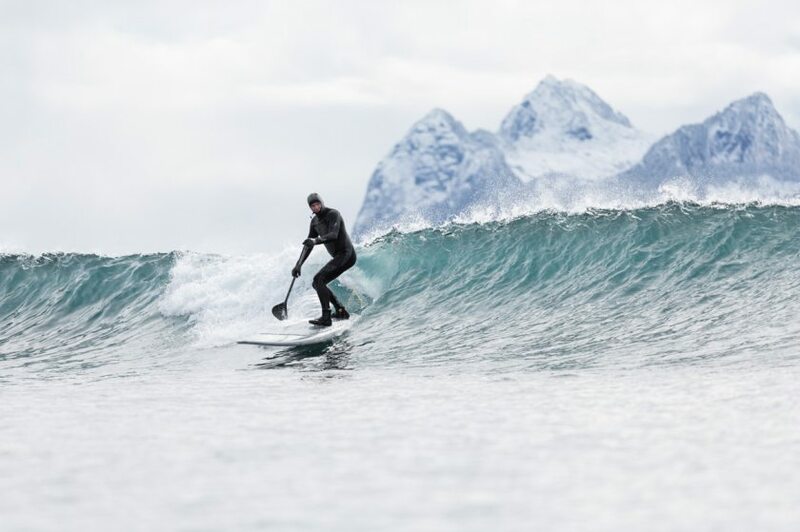 You can rent a SUP in Seward or Homer and go right off of the shoreline. 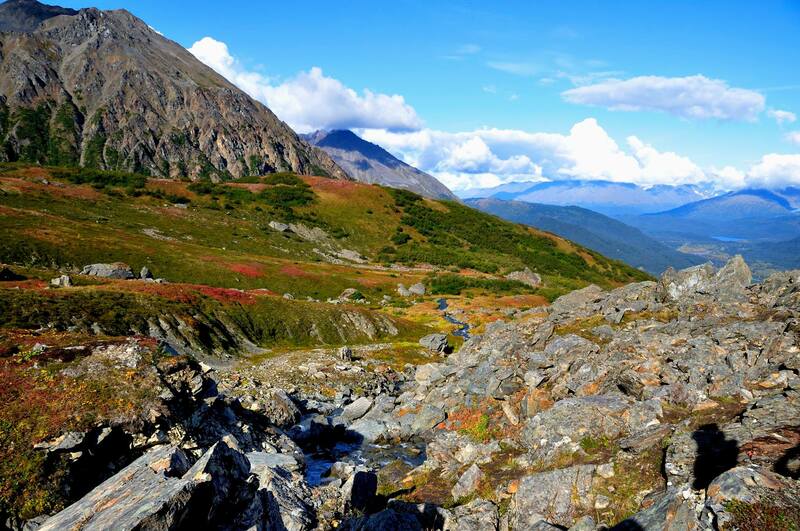 Or you can go off the beaten path, like this adventurous group with Steller Air in Homer, AK. Beautiful photo from Scott Dickerson Photography. The balancing act can be a little tricky at times, but once you get the hang of SUP you will probably be able to bust out a little yoga with one leg while paddling with one hand. Maybe? That’s pretty impressive! Bonus: If you have friends that prefer to kayak, you can still hit the water together and make some epic multi-sport memories! Awesome photo from Howl Alaska. 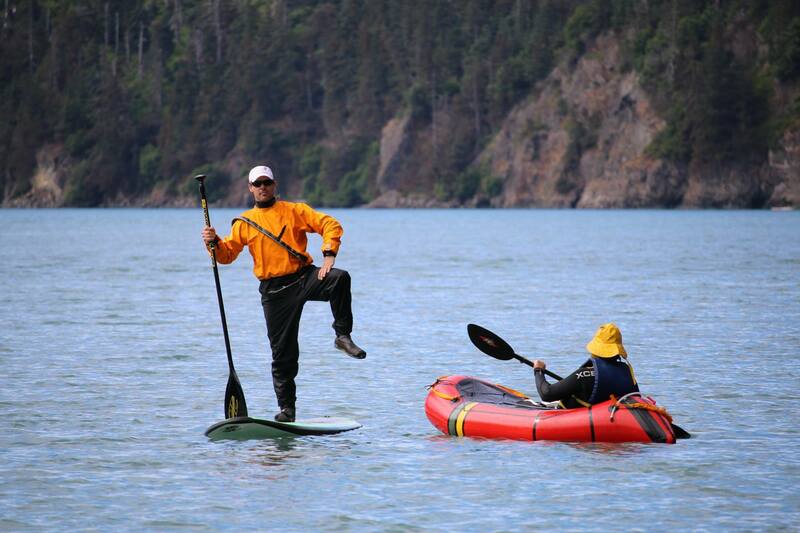 Some folks are even cool (and coordinated) enough to multi task on a SUP. 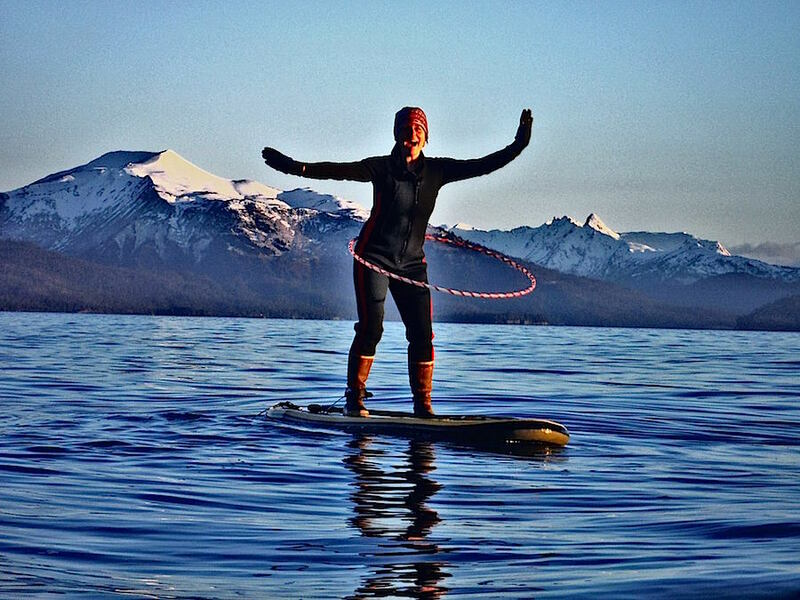 Hoola-hooping on open water with snow-capped mountains in the background? Yes please! 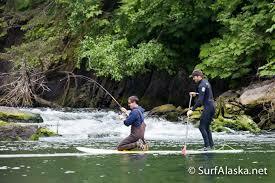 Or how about SUP and fishing? Now that is awesome. 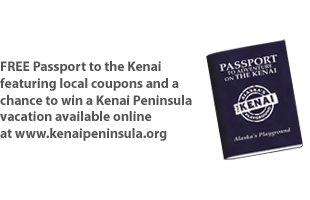 And totally fitting for all of those Kenai Peninsula fishing fanatics! 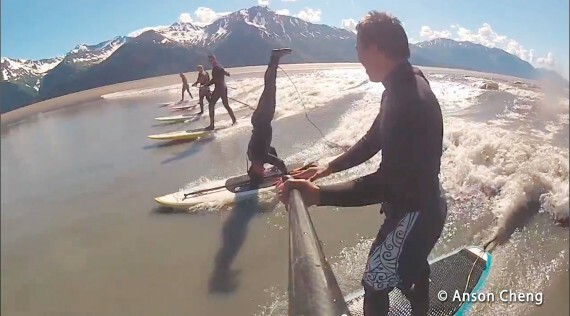 Or maybe even headstands on a SUP? Now that is talent! 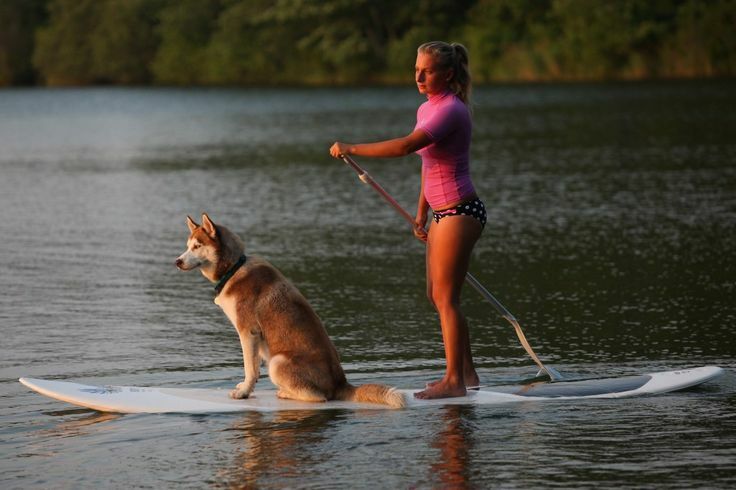 And if you want to include your four-legged best friend, SUP is also a dog friendly sport! 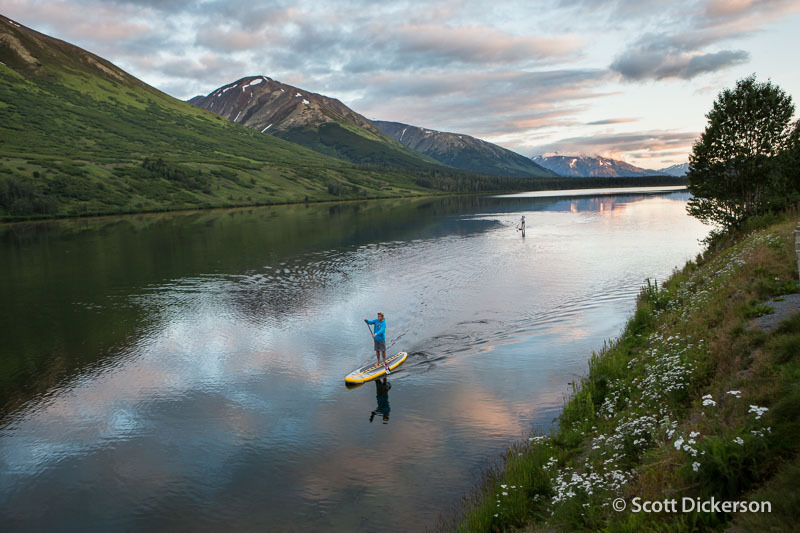 Make it an evening trip and you might even get lucky enough to catch an epic Alaskan sunset via SUP. Great photo from Scott Dickerson Photography.